The Benson sisters take their show out of Gotham and head across the country to Seattle and she's brought Black Canary with them. That is no surprise (she is a regular in Green Arrow as well), but Roy Harper? Alright! 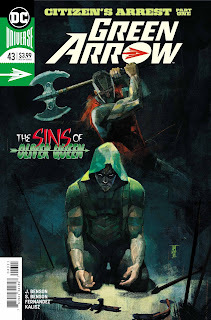 The Bensons use this first issue to check off all the Green Arrow boxes...the Island, former spoiled rich kid, people acting awful so Ollie can go SJW on them and save the day...well, the last one gets a bit more complicated. What starts as a Fat Cat bullying his way through Seattle quickly turns around and the Fat Cat becomes the victim. Yea, he deserves what he gets...almost. I mean, there are just so many things that make "losing your head" fully deserved. Of course, Ollie has to shift gears as well. He starts out teamed up with his former side-kick, Roy Harper, and I couldn't have been happier. Roy is a hero without a book right now and while I want more of him here, it seems like he is just here to show us he is off to the Sanctuary. Another box checked it seems. During all this, we see that Ollie finances are in a shambles (this time from trying to help people), get a couple No Justice name drops and see the Kate Spencer will be continuing on after Ben Percy's so-called "Trial of the Century". 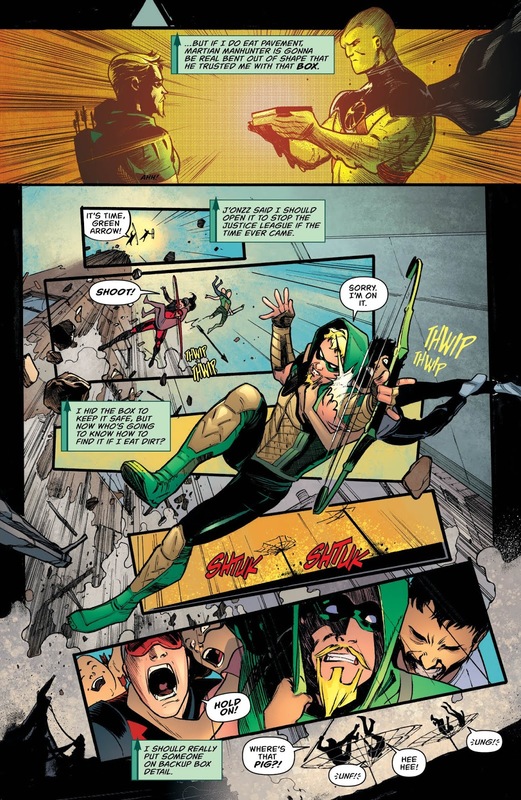 I like that a lot and I also liked that the Bensons addressed the "Box" that Ollie got at the end of No Justice and saw who will look after it if Green Arrow dies. We do get a whole lot of setup, but eventually, we get to the villain of the story...The Citizen. He is a bit of a walking cliche with the "vote to kill the bad guy online" trope and I have to say the jury is still out with this guy. I'll tell you one thing...he is downright vicious! I don't think anyone will be surprised with the cliffhanger so I'm glad the Bensons get there at the end of their first issue. 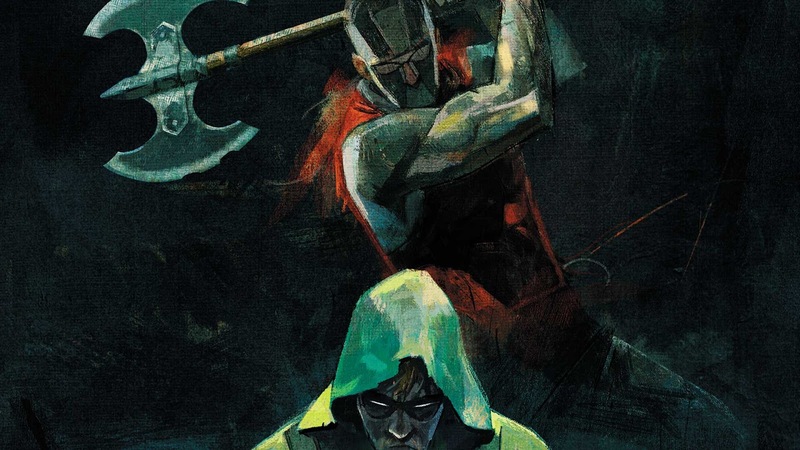 I won't say this is the best issue of Green Arrow I've ever read and I won't tell you this is a highly original start for the Bensons. I didn't hate it, even though it was a tad boring, but I still am keeping the faith. 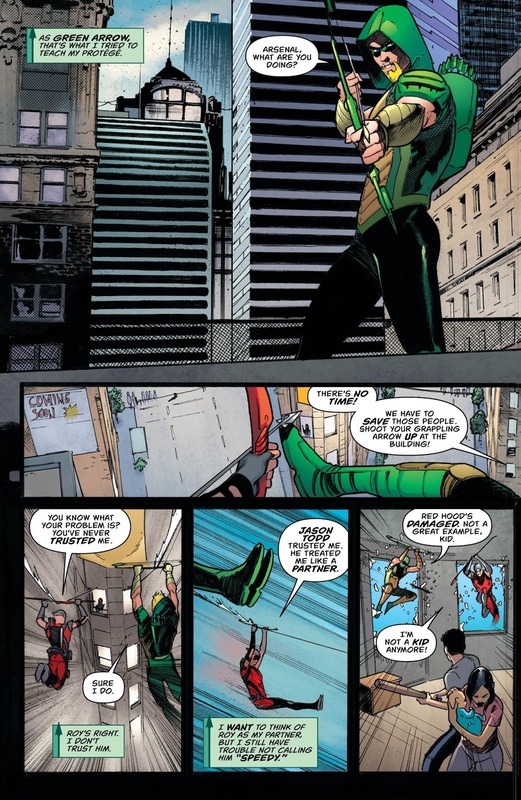 There is something here and I love the way the Bensons write Ollie and Dinah together. That's not enough to give this issue super high marks, but is plenty enough to keep me interested. I am not a fan of Javi Fernandez's art so the best thing I can say here is that I didn't hate the look of this issue. I didn't stop and gasp at any art we got here...but I also didn't stop and gasp at any of the art either. I hope you know what I mean. The Bensons start their run on Green Arrow and while it is not the most original beginnings, they check most of the Green Arrow boxes and the Ollie/Dinah dynamic is solid. The art is serviceable but doesn't do anything to make it stick out. I am cautiously optimistic for the Benson's run, but that's more than I can say about a lot of books these days.